When we last left off, I was arranging the East Lake pieces in different ways to decide what was the best combination to create the pieces I was looking for. Initially when I saw these in the emporium, I thought I would rework the mirror into a shelf system attached behind the dresser but that didn't seem to give me enough utility for storage. Then my thinking switched into imagining a piece with a more substantial backdrop - the headboard. So one would ask, how will that help with the storage - and the answer is - It Won't! BUT the architectural statement it would make could be striking and it would enable me to expand the width of the dresser top to provide a much more functional work surface (which in the end is more important to me and the application in the upcoming staging project than shelf storage). So with a combination of pieces decided, I moved my thinking to how to create a visual finish to the pieces so that it highlights the interesting architectural elements of that style with a current aesthetic that would appeal to today's home seekers. Besides, the existing finish was worn in varying degrees depending on the area on each piece. In some of the pieces, the wear was minimal; in others it was more extensive yielding an inconsistency to the overall finish - in the worse case, it looked as though the piece had been left outside to bleach and weather in the elements. The pieces in the collection were constructed out of alder wood - Although classified as a hardwood, alder is one of the softest of all hardwoods and is more commonly referred to as a semi-hardwood. On a hardness scale, alder ranks just above pine and poplar. It's light color in its natural state and shows a grain texture which has similarities to pine and poplar. I like the look of the grain lines and want to show that off in the final piece but I didn't want the detail of the wood grain to dominate the final look. Today, buyers seem to appreciate more of a painted look than natural wood (which is why so many of the older pieces are overlooked by decorators - they are stained and not painted). Painting a piece can be tricky. If you're striving for a painted finish on a stylish piece, you're best advised to spray the finish to get that smooth look - a less than quality paint job, when you're going for that fine finish can be worse than leaving it natural - cheapening the piece. I find that employing a technique that covers the grain partially with either a semi solid stain or a paint and wipe off effect will add a dimension of color and finish without completely hiding the underlying wood grain - the overall effect is one where the piece actually looks as though it has aged (weathered) but with a clean casual elegance - rustic or shabby in a good way - if done well, it can be introduced into many decors because it becomes a statement piece that compliments the other furnishings. So my path was set - first step - strip the existing finish and lacquer off of the pieces and see what condition the wood is in once bare. The photo to the left shows the dresser after I stripped it - the headboard is shown before stripping. As you can see, the stripping process has revealed an unevenness in the condition of the wood - all the more reason that a semi solid stain is probably the best choice. Moving along, I stripped the headboard in the same fashion as the dresser. For the stripping process, I used a canned stripping liquid (I prefer Formby's brand but there are others available as well), coarse steel wool pads, some clean cotton rags for wiping the varnish/liquid material from the wood and, of course, protective wear and drop cloths - gloves, eye wear, old clothing that you don't mind getting stained and protection for your floors - even the neatest person will find that dripping and splattering is inevitable. More than once I've stained a good sweater or shirt rushing to just get started :-). I suggest following the instructions on the stripping agent container for your best results and work in a well ventilated space - I find that staying focused in a small area of the piece when you strip it yields the best result - and then wipe it clean before moving on to the next section. The problem with sanding to get the finish off is that you'll end up removing the top layer of wood which carries the aged patina of the wood - this can result in a blotchy effect and when you apply your staining later, it comes out unevenly. If you incorporate sanding in the stripping process, just do it carefully. I had purchased some semi solid stain for a previous DIY project and decided to revisit the color of that stain as a possible choice for this one. This is a water-based product from Benjamin Moore called Arborcoat - and it's a stain that's intended for decking and siding. From speaking with my Benjamin Moore consultant Ken at the hardware store, I learned that the decking and siding semi solid stain has some content of wax to help with moisture repellent. I actually liked this idea so a gave it a try. The color I had on hand (which I really like) is called Fairview Taupe - hints of light brown and grey with other earth tones in the pigment. The stain is flat in terms of its luster - again, adding to the casual rustic quality I was looking for. On past pieces, I have applied a hand rubbed wax finish which gives a slight luster to the wood and I like the feel of it - much like the way old English scrubbed pine pieces feel after they have been stripped and finished. I apply the stain with a decent quality nylon brush. For the effect I am striving for, I apply a thin layer to cover the wood and then use the brush to create clean stroke lines and not build up of the stain in any one spot. I want the undertones of the wood color and grain to peak through the stained surface - much like you'd expect for a piece that has weathered over time. You might be surprised but a little stain goes a long way - work the brush and spread the stain enough so you can see the wood grain through the pigment. Depending on how evenly you have stripped the piece, you will find that the stain will adhere to the wood in a similar fashion. Let the stain dry to the touch before going back over it to add additional stain to suit the look your seeking. Do it too quickly and you may find that you have applied too much and therefore need to remove it by stripping or sanding. Without allowing the grain to show through, it can appear as too flat. Here's a photo of the headboard after I applied the stain and added a few bits of green color in some of the carved areas to see if I liked the highlighting effect. You can see that the finish is dull (don't worry, that will change when you decide to apply your top coat of wax or urethane). If you decide to use an indoor semi solid stain that does not contain a wax component, you can use a urethane based finish to add some luster and protection. I really like the color - in the photo above, you can see the wood grain coming through and, at the same time, see an evenness in the way the stain has taken to the wood. Now that horizontal piece of unfinished wood in the middle of the photo was just a test to see if I'd liked the look of a small shelf for storage. If I use it as a kitchen piece, the shelf could accommodate frequently used jars of spices or condiments - if it serves as a hallway piece, then some votive candles or decorative clay pots with small plants could work. I like the effect of a small shelf so stay tuned to see how it comes out. I did invest in a few new tools for the project. This is not unusual - I find that with each new project I pick up a few items to help me create a better product in the end. Here you can see that I bought some hex bolts, some wider drill bits, a hand planer, a set of chisels & files, some adjustable head pliers, a square and some additional wood (poplar posts). Not shown are some other wood items, pieces of maple 1 inch planks of 3 inch and 4 inch in varying lengths and a sheet of maple plywood. Let me explain why the need for the wood and bolts. For stability, I felt that I would need to affix the headboard to the dresser piece. I didn't want to make that connection permanent for a couple of reasons - first - moving the combined piece as one unit would have been very difficult (to fit through doorways and up stairs) and second - there may be applications where I'd like to use the pieces separately so finding a way to temporarily join both units together seemed the logical solution. As far as the wood is concerned, there are a couple of reasons. First, the depth of the dresser is only 20 inches and as such the working surface of the piece was a bit on the small side. Typical counter tops are 25 inches deep. Since I am planning to install a butcher block surface on the dresser, I wanted one that would have utility - so it need depth. If I hung the extra depth off the front end (so the back of the dresser would sit flush to the headboard, I would have had too much overhang on the dresser front which would not only look awkward but it would have interfered with the use of the dresser drawers. So, to solve these problems, I decided to add some depth to the sides of the cabinet so it would sit flush to the headboard and allow for less overhang in the front and a deeper counter surface. 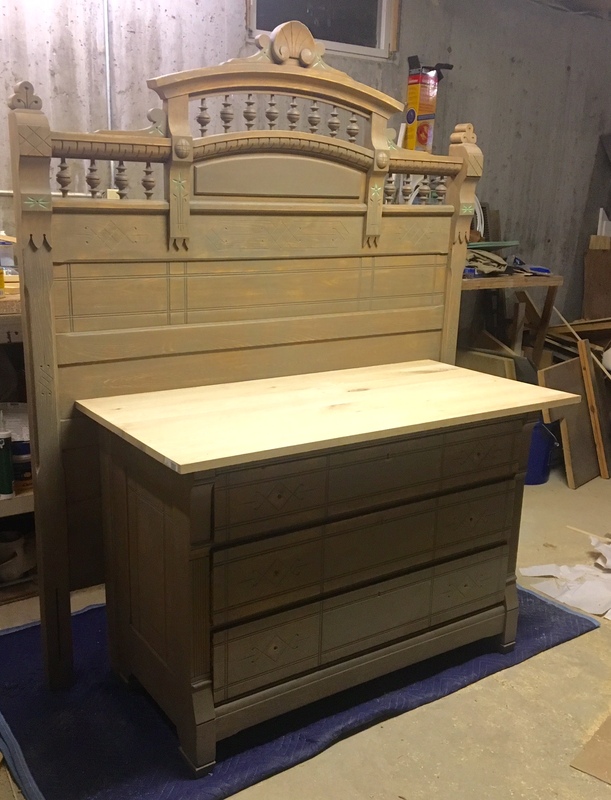 Then a bright idea came to mind - why don't I just finish the back of the dresser so if I chose to use it on occasion as a free standing island piece, it would look finished on all sides. In certain staging applications, I may not have the wall space to accommodate the piece with the headboard backing. This photo shows the rough look of the dresser back before I installed the finished back. The back wood was solid but not a smooth finish (thus the need for the hand planer). If I wanted the side posts to sit flush to the dresser, I had to remove the uneven spots. The planer worked great. Next I decided to design the backing. Before taking the final measurements, I needed to remove the rollin g wheels and add some feet to the base of the cabinet. I milled the feet from left over English pine scraps I had on hand - I affixed the feet with glue and screws - now the cabinet was the correct height to design the backing. I purchased two posts of poplar that were 2.5 inches square and 3 feet long - made from gluing three pieces of 1 inch stock together. I could have made my own posts using the same technique but my time was better used buying the posts. Using the poplar posts and the maple plywood and lumber, I designed a simple raised panel piece. Presently, I don't have a router tool but I have had some success in the past to using my table saw to create the mortise and tenon joints for the panel assembly. I think I will invest in a router for future projects but my table saw got me through it this time. Here's a look at the finished panel before I applied it to the dresser. I tapered the bottom of the posts to compliment the feet I installed on the original dresser legs. I also made sure that the posts were slightly offset to the cabinet on the sides to create some design interest rather than attaching them on the same plane which would have looked makeshift to me. Using glue and wood screws secured from the inside of the dresser, I attached the panel backing. Here's a photo showing the panel attached to the dresser after I applied the coat of stain. You can see how the poplar wood took the first coat of stain as compared to the side face of the alder wood dresser. With some light sanding to both woods and carefully applying a second thin coat of stain, I achieved a more uniform look on the wood surfaces. On the cabinet, you can see the alder wood top that is there. It was on this top that the marble slab sat. Because of the difficulty I had in devising a way to fix the butcher block to the cabinet through the marble slab, I decided to eliminate the marble and replace it with a red oak top that would be fixed to the cabinet's alder top. On top of this surface, I plan to affix some blocks 2 1/2 inches in height to elevate the top surface - the 1 3/4 inches birch wood butcher block. The space between the top surface of the oak top and the bottom surface of the butcher block would accommodate the storage of cooking sheets and cutting boards. The photo to the left shows the red oak top. This is not installed yet as I am deciding on the size to use. The piece I purchased is 24 inches by 48 inches - I plan to shorten both lengths and smooth the hard edges and then fix it to the base using some glue and (most likely) wood screws from inside the cabinet. I will then treat the surface of the oak to protect it during use - probably a clear satin polyurethane finish (the color of the wood is beautiful as is). In the photo to the right, you can see the temporary placement of the butcher block surface. I am still deciding on how to finish the blocks (stain or paint) before attaching them to the oak surface and the eventually the butcher block. This image should give you a general idea of where I am going with this piece. Oh, and by the way, that spice shelf I mentioned earlier is shown on the headboard - I made it from 1/2 inch pine stock and stained it to match the headboard. 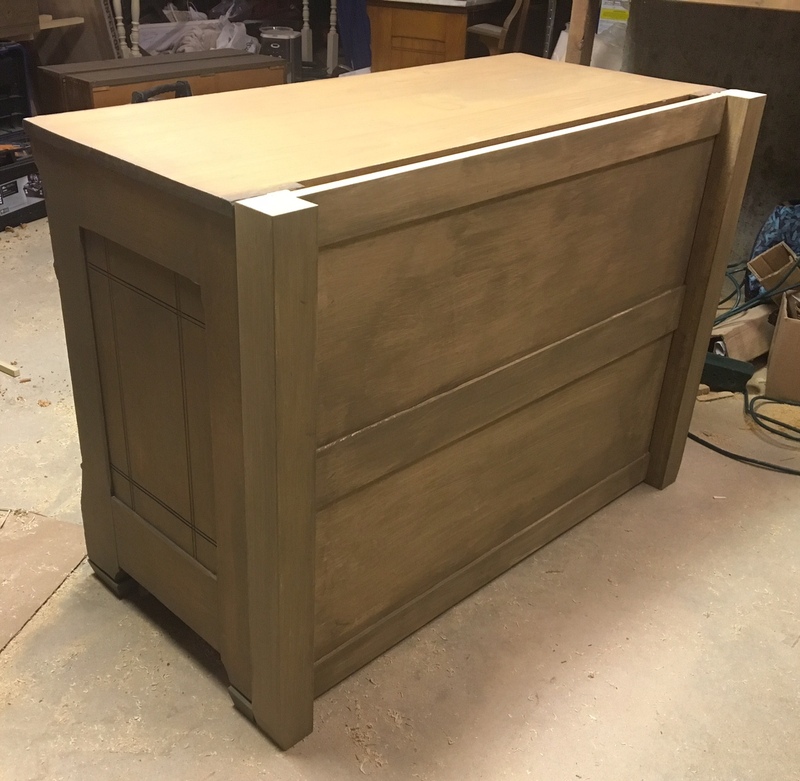 With the removal of the rollers and the added weight of the back panel and the oak and birch counters, this piece is very stable in place and is heavy enough to support the headboard behind it against a wall WITHOUT having to bolt it to the back of the cabinet. That provides maximum flexibility in using the headboard for this application and for potential use as part of the bed when I refinish the other pieces. I have decided to apply a hand rubbed wax finish to the pieces. My choice is MinWax furniture wax tinted with a dark wood stain (you can buy it with or without a stain pigment). This is readily available at most hardware stores. I like the pigment for two reasons - it helps to even ou t the differences in the way that the undercoat of stain adhered to the different woods (alder, poplar, maple and pine) and it will allow me to rub the dark wax into the carved details of the piece highlighting the carvings. I'll take some close up photos to show the details in the next installment. I still need to address the drawer pulls (trying to decide on whether to clean up the original ones which is my preference or replace them with new pulls). I also have a few other enhancements to evaluate and I need to decide on the finish of the inside of the drawers before I am done. But you have to wait a bit for that unveiling. Stay tuned - I'll blog about the final chapter for this piece but it may visually debut first in the upcoming listing I have it planned for this spring. I hope you found this helpful. Please sign up to receive notifications from our blog on new topics, stories, market information and our other staging projects. And we invite you to like us and follow us on Facebook. 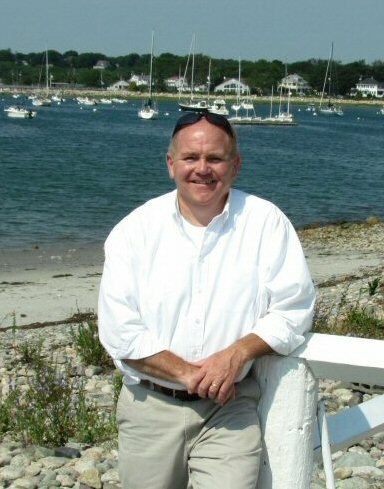 About the Author: For more than twenty years, David S. Drinkwater has been setting a quality standard for how real estate should be marketed and sold in the coastal communities of the South Shore - the "Gold Coast" region between Boston and Cape Cod. Consistently one of the region’s Top Producing Realtors®, David has earned numerous sales and recognition awards over the years. In his local community of Scituate, David has dominated sales in all price ranges since the start of this Millennium - based on MLS transactions measured as of August 5, 2015, David has closed more sales (both units & dollar volume) than any other agent – in all price ranges. Combined, his dollar volume is 66 percent higher than that of the next closest agent. The October 2004 issue of Boston Magazine named David as the Top Power Broker South of Boston for dollar volume sold in 2003.